When we are transporting goods or purchase goods that are needed to be shipped, we must see to it that our cargo are in the right hands, those hands that will take good care of our shipment as much as we do. We want that our shipment are secured and with insurance, as possible. You may also see billing invoice examples. Furthermore, we see to it that we have evidences of our contract with the carrier of our shipment in case something will happen to our cargo. The document that would perfectly suit our needs stated above is the transport bill of lading. With this document, you have a contract and a contact with the carrier that you have been transacting with regarding your shipment. You may also like bill receipt examples. Need some examples of transport bill of lading? The next section will provide you comprehensive examples that may give you an idea on the contents of a bill of lading. Check it out now. A bill of lading is a legal document that binds the shipper and the carrier for their shipping transaction detailing the type, quantity, destination of the goods being carried, and other important information. This also serves as a shipment receipt when the carrier delivers the goods at the destination and must accompany the shipped goods, no matter the form of transportation. It should also be signed by an authorized representative from the carrier, shipper, and receiver. A bill of lading is a form of a simple receipt that acknowledges that the items have been loaded. Hence, it must contain the complete information with regard to the item such as the quantity, price, description, and any marks pertaining to the item. It must also contain information about the seller and the buyer. The name and address of the buyer and seller must also be present, similar to the usual receipt of payment. There can be other contract of carriage aside from the bill of lading, and the bill of lading itself can just be the evidence of the contract of carriage. However, the parties may opt not to have a separate contract but consider the bill of lading itself as the general contract of carriage, binding the parties to the transaction they have committed. The contract is valid in courts in case of litigation and can be used as a valid evidence. A bill of lading also serves as a document of title to the goods subject to the “nemo dat quod non habet” rule, or simply “nemo dat” rule, which is a basic principle that states that a certain person who does not own property, such as that of a thief, cannot confer the rights of ownership to the thing to another except with the authority of the true owner’s. You may also see restaurant receipt examples. You may also like travel invoice examples. There are different types of bill of lading that are commonly used in shipping transactions, and they are discussed in detail below. 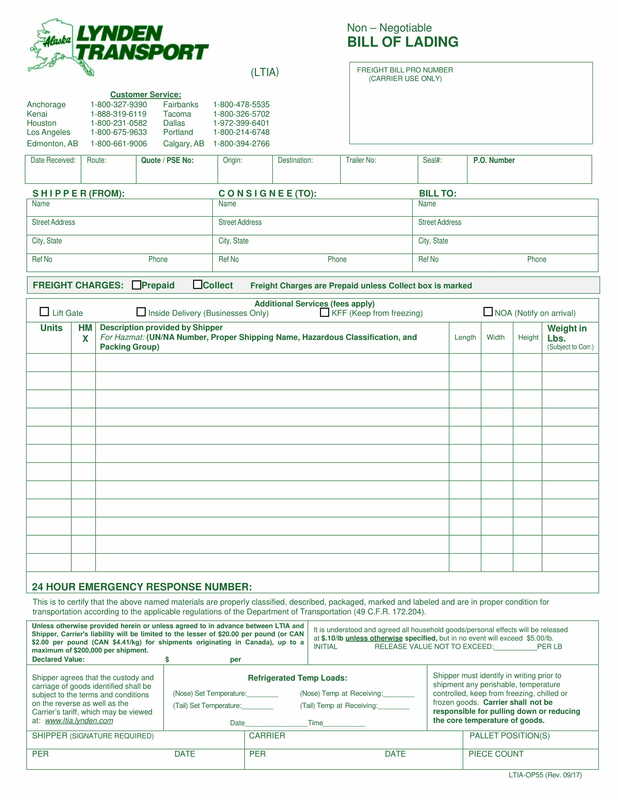 This bill of lading is used when the goods have been paid in full and are shipped directly to the customers. Straight bills of lading are non-negotiable, meaning, they cannot be endorsed to a third person as a form of payment or they are not able to be transferred or assigned to the legal ownership of another person. For this type of bill of lading, the shipping company has the obligation to deliver the shipment to its consignee on presentation of an identification. This is also called consignment bill of lading. You may also see service invoice examples. 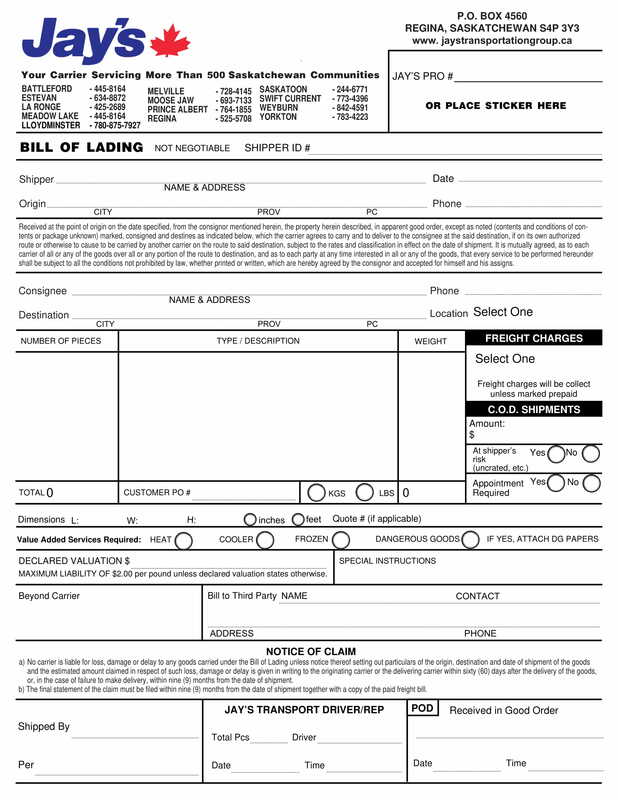 This type of bill of lading is used when the cargo is purchased on credit and to be payable through a bank. In this type of bill of lading, the bill of lading is negotiable, and it functions like a title of goods. An original document or a copy of the bill of lading is needed and must be secured by the buyer to take possession of the cargo at the point of destination. Just like any other bill of lading, its content includes the name of the shipper and carrier, the name of the ports of destination and port of loading, and any other necessary information to complete the document. 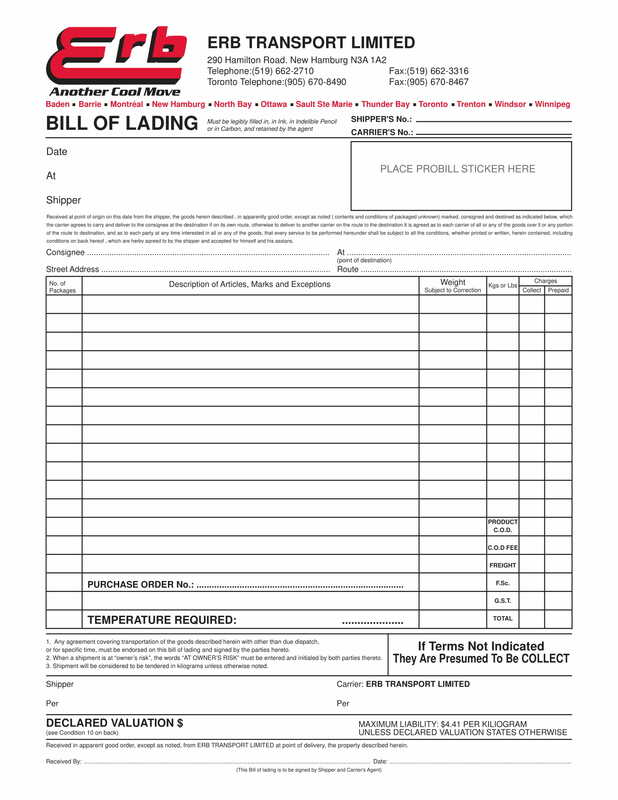 You may also like what is bill of lading. 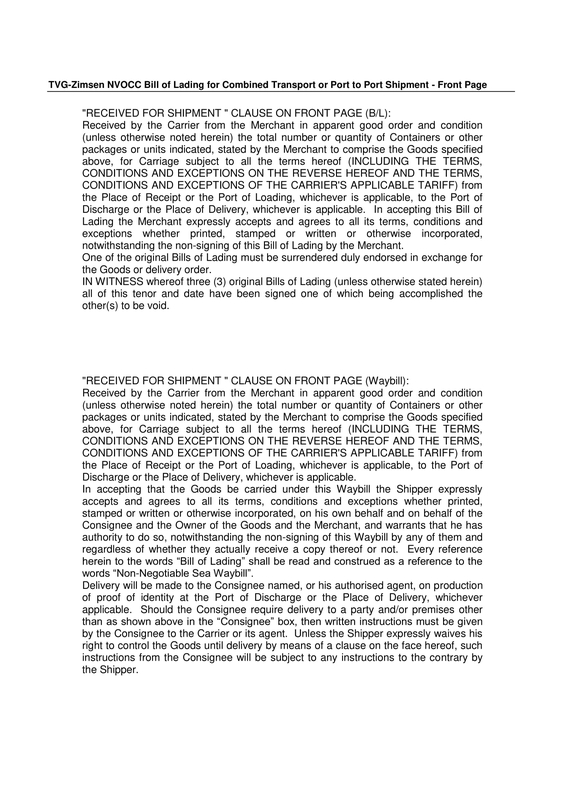 This document serves as an official receipt of goods by the carrier, usually an airline, and as a contract of carriage between the shipper or owner of the goods and the carrier. This contains the shipper’s name and address, consignee’s name and address, three-letter origin airport code, three-letter destination airport code, number of pieces, gross weight, a description of the goods and any special instructions with regard the shipment, and declared shipment value for customs. Original bill of lading is provided to the shipper who will send it to the importer or hold it until payment has been made. Once the shipper has confirmed and authorized that the goods can be released, this bill of lading can be sent to the importer in which they can surrender to the freight forwarding company to secure the release of the shipment. This is made to control the cargo especially when the buyer has not yet paid in full the seller or the manufacturer of the goods. You may also check out payment invoice examples. 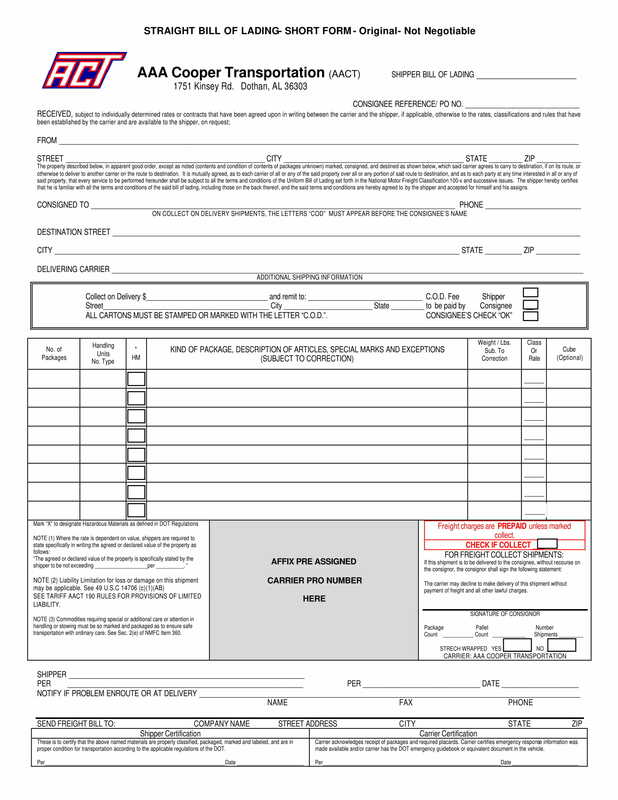 This type of bill of lading is usually the first transportation document that is issued for an international shipment. This serves as a document for transport goods over land via rail, road, or inland waterway, to the point at which the exporter’s international carrier can place it on a ship. This is a simple agreement that binds the owner of the goods and the carrier, detailing the description of the goods and their value, origin and destination, and the terms of their transportation. 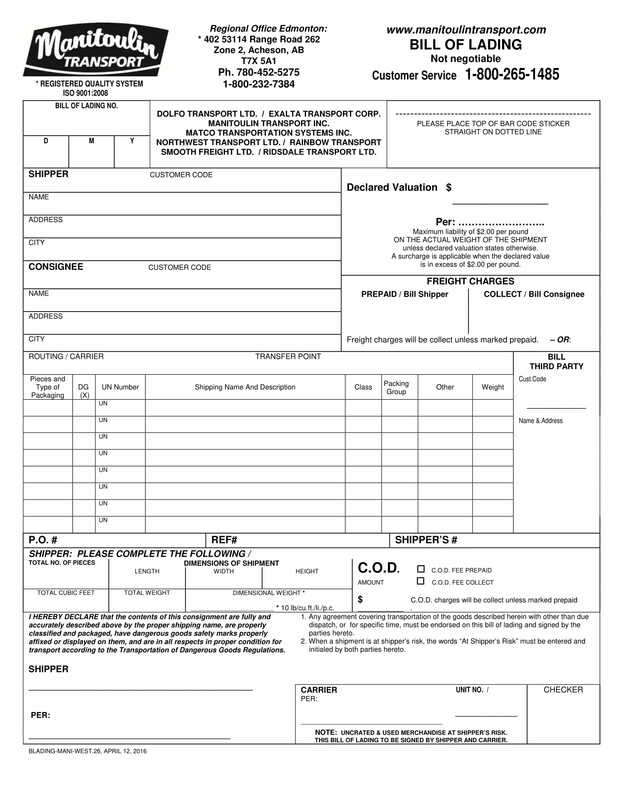 Also known as combined bill of lading, intermodal bill of lading, or multimodal transport bill of lading, this type of lading is issued from its origin to the predetermined destination for different ships and/or different transportation aircraft, ships, trucks, railcars that carry containerized door-to-door shipments. You might be interested in billing statement examples. The full liability for all modes of transportation for the entire journey lies on the principal carrier or the freight forwarder issuing the multimodal bill of lading. This bill of lading serves as a general contract between a shipper of a good and a carrier used in international trade. 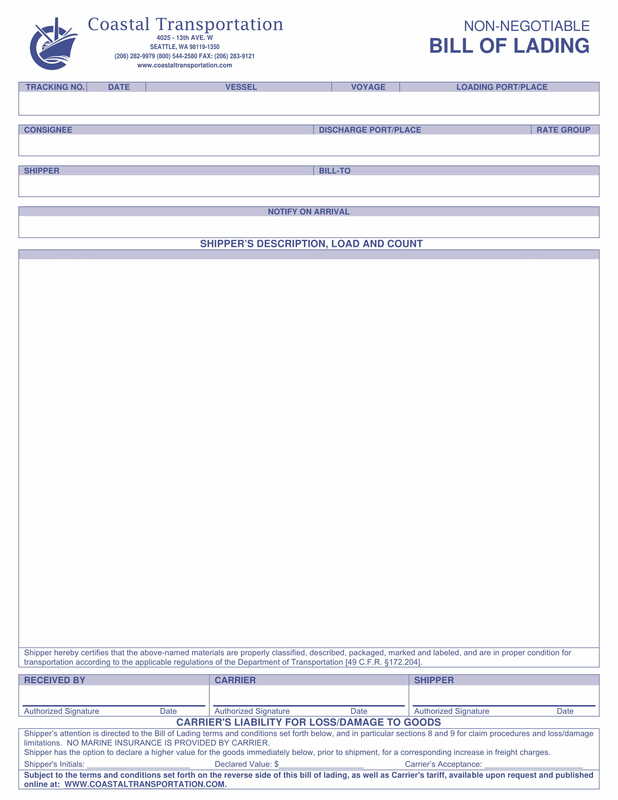 This document is required when you ship goods, and it acts both as a receipt and a contract: receipt in a way that it shows that the carrier has received the freight as described and contract in a way that it documents the terms of delivery that stipulates that the shipper must deliver that cargo to the buyer in good condition. 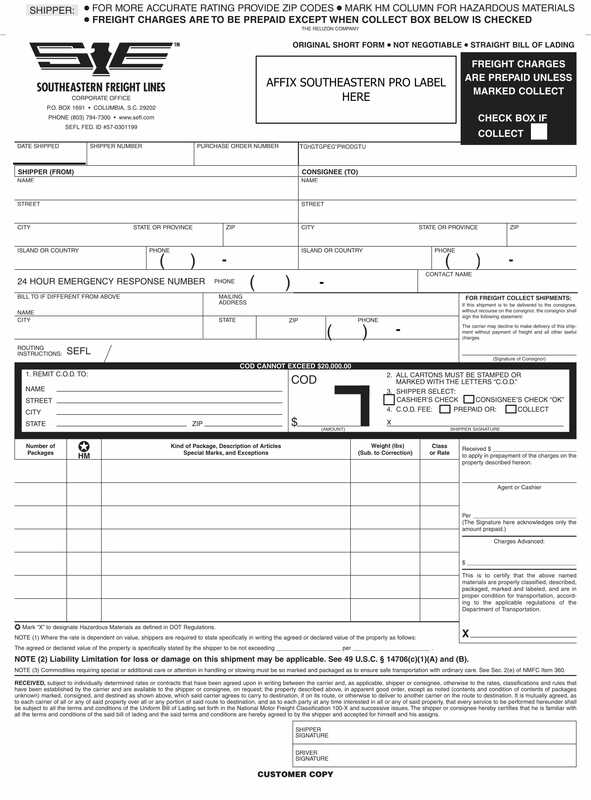 This type of bill of lading is a second set of bills of lading issued by a carrier or its agent to substitute for the bills of lading that has been issued at the time of shipment and is commonly used during foreign-to-foreign shipments, where the shipper wanted the information with regard to their supplier to be private. You may also see hotel receipt examples. Two sets of bills will be switched during the shipment primarily to protect the supplier’s information from the buyer or consignee. In this type of bill of lading, it has been endorsed but the endorsee is not named, which means that the holder of the bill of lading can claim possession of the goods. Hence, this type of bill of lading is considered a negotiable bill of lading. The buyer holding the original bill of lading can claim the goods as long as he or she will submit at least one copy of the original bill of lading. You may also see hotel invoice examples. 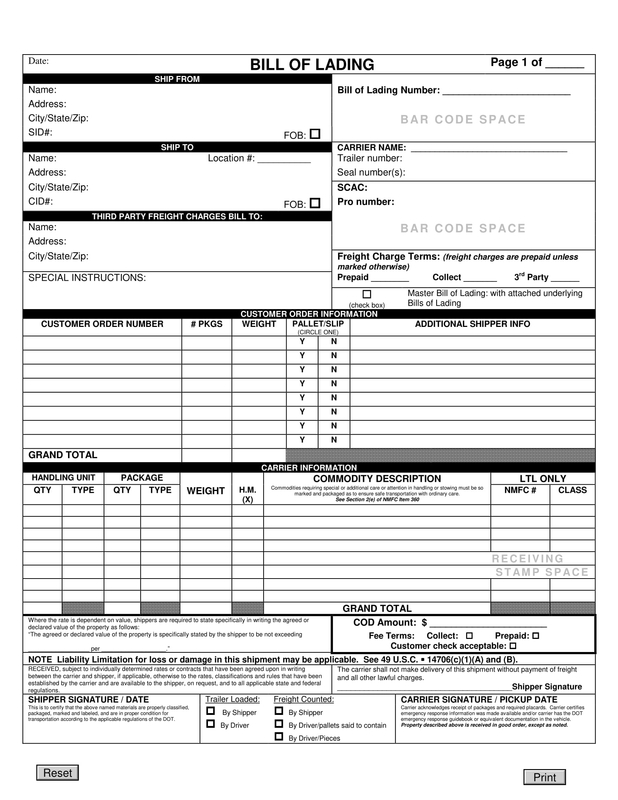 This type of bill of lading is used to indicate that the goods in the shipment were in good condition upon shipment when loaded into the vessel, similar to a carrier’s official sign-off. A clean bill of lading is usually issued to fulfill the requirements set forth in letters of credit, a letter in which the purchases rely on to pay for imports. You may also like construction invoice examples. This type of bill of lading is the opposite of a clean bill of lading as it indicates that there are damages to the delivered cargo. Also known as dirty or foul bill of lading, this bill of lading is used when the products on the shipment deviate from the specifications in the delivery or the expected quality. It is the receiver who declares that the bill of lading is claused. You may also check out medical invoice examples. This is usually a notation put on a bill of lading that is used to indicate that the goods in the shipment are in good condition and are certainly on board the vessel. This on board bill of lading is usually required by banks that fund shipments over all other types. This is also known as shipped on board bill of lading. You might be interested in school receipt examples. For this type of bill of lading, it is used as a proof of shipment, and the exporter or manufacturer of the shipment may require on deck bill of lading to get paid. Hence, it must be secured with the shipment. At first glance, bill of lading may seem complicated to fill out and process, but as you go on dealing with bills of lading, you will surely get used to the process of the transaction, and everything will be easier for you. Given the discussions above about bill of lading, you now have the basic knowledge needed in order to deal with bills of lading. You may also see simple invoice examples. 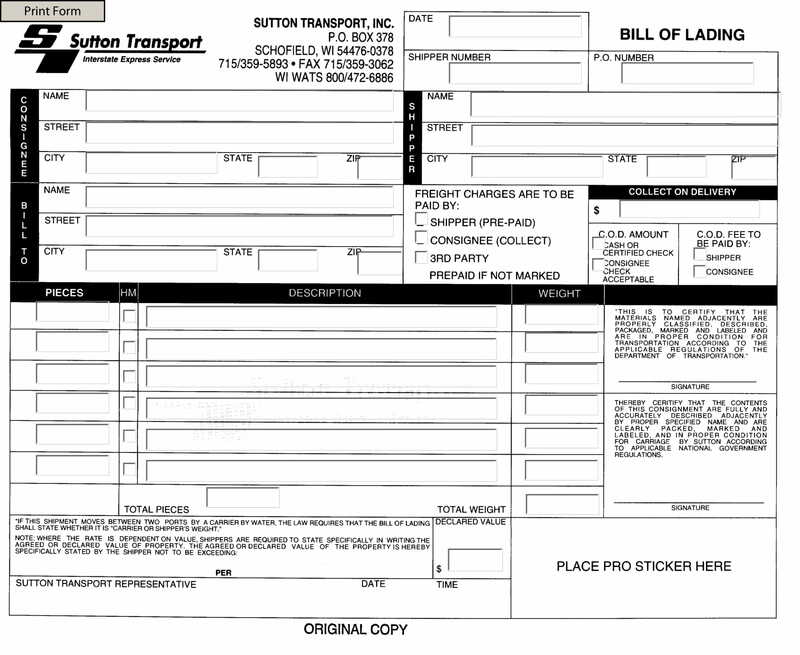 Do not forget that there are common types of bill of lading which are straight, shipper’s order, air waybill, originals, inland, multimodal or combined transport, through, and switch bill of lading, and there are also less frequently used bill of lading which are blank endorsed, clean, claused, on board, and on deck bill of lading. You may also like sample receipt examples. For a visual information of transport bill of lading, you may also refer to the examples above.